While the cabinet struggles to find a unified position on Brexit more than 18 months after the referendum, the Labour party is facing a different kind of divide, that between the party’s leadership and the bulk of its supporters. Labour’s policy is to remain part of the Customs Union and Single Market for the duration of any post-Brexit transition but not to do so permanently. Among all voters, only 16% could correctly identify this and just 26% think Labour’s position on Brexit is clear. Jeremy Corbyn has consistently argued that remaining in the Single Market is not compatible with leaving the EU but 56% of Labour voters and considerers (defined as anybody currently voting Labour or who said they were likely to do so in future) believe the party should support staying in the Single Market and Customs Union permanently after Brexit with only 13% opposed. Of most interest here are the views of Labour Leavers. While they (unlike other Labour supporters) oppose having a ratification referendum on the final deal, their opposition to permanent membership of the Single Market and Customs Union is much more muted. 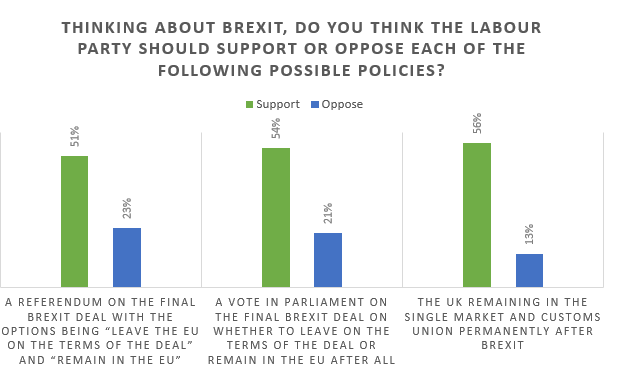 In fact 37% of Labour Leavers (again, defined as those who currently vote Labour, are likely to do so in the future, and voted Leave) think the party should support permanent membership vs. just 26% oppose it. Only 43% of Labour voters feel the leadership agrees with their view on Brexit. The figure for Conservative voters is 52%.